The popular Christmas voucher deal is back! 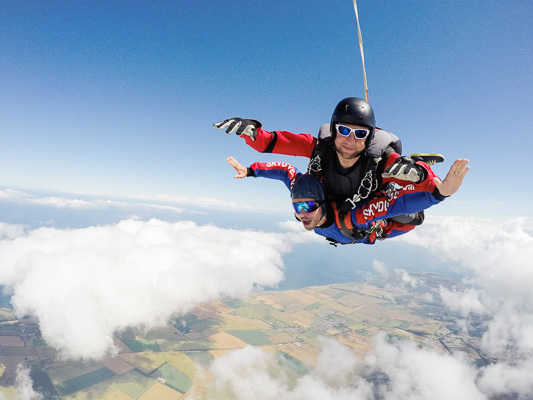 For a limited time, you can grab our Yorkshire Tandem Skydive Experience e-voucher for only £199 – that’s £50 off the current weekend list price. After purchase we’ll send you the e-voucher directly via email. All you’ve got to do is print it off and pop it in the card – simple! If you love leaving things to the last minute, then don’t worry! Gift vouchers will be sent out up to, and including Christmas Eve. Like all offers, there are a few additional terms and conditions. Read on to discover more! We’ve got something for all budgets, so if you’d prefer paying a little less – we’ve got you covered! Tandem deposit vouchers start from as little as £49 right up to the full cost + the filming and photography media packages. Or, why do a tandem skydive when they can go solo! Again, we have a range of other vouchers available suitable for all budgets. The boring bit, but worth a read before booking! The voucher will be delivered as a printable ‘e-voucher’ to the email address you provide. The experience needs to be booked by 31 January 2019, with the experience to take place between 1 January 2019 and 31 March 2019. 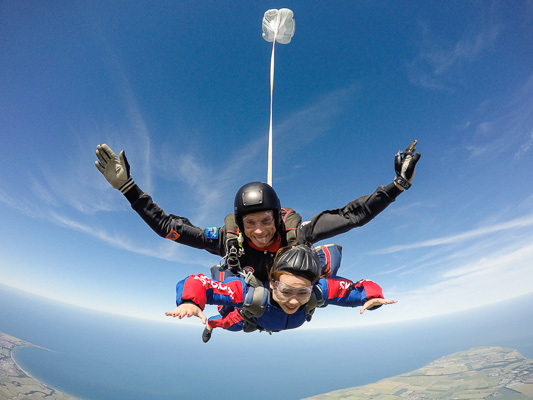 If the Dropzone postpones the experience due to unfavourable weather, another date must be booked for the experience to take place by 30 April 2019. For an additional fee, the Christmas Tandem Voucher can be upgraded to an ‘Any Time’ voucher for the remainder of the 2019 season. This upgrade must be paid for by the end of April 2019. The offer cannot be used in conjunction with any other booking, offer or discount. Offer ends 24 December 2018. The general terms and conditions of all bookings and sales can be found here. Sadly, we can’t share the love of skydiving with everyone. Due to the nature of the sport there are some age, weight and health restrictions. The minimum age for tandem skydiving is 16. 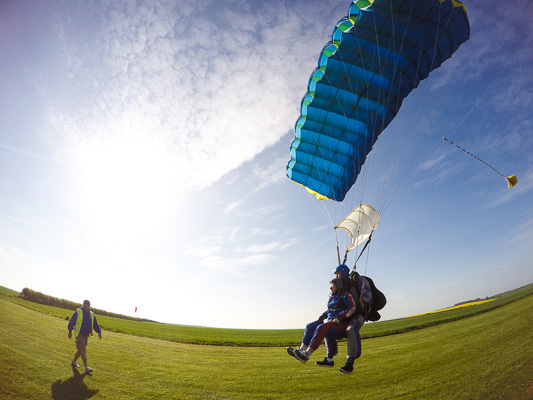 Under 18’s require parent/guardian permission in the form of signing the British Parachute Association membership agreement and medical declaration here. Participants no longer need a doctor’s signature if over the age of 40, however it is advised you read the Medical Declaration Form 115A as described below. 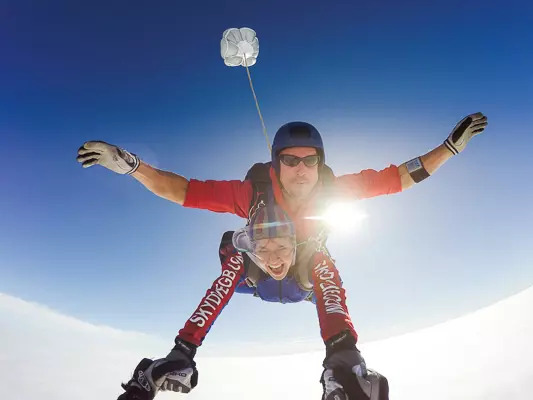 The maximum weight for tandem skydiving is 15 stone (95.25kg) fully clothed (unless you want to jump naked) and your weight must be in proportion to your height. There is no height limit. 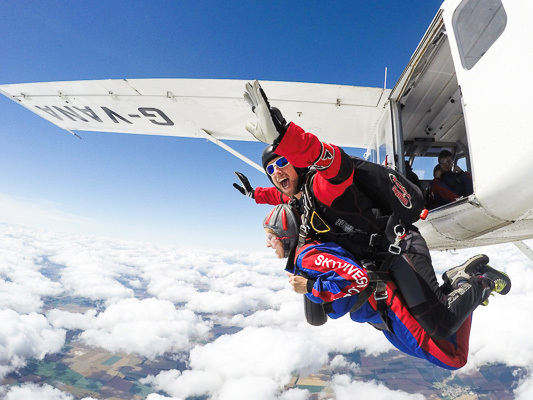 There are a few medical conditions which can cause issues when skydiving – these can all be found on the Medical Declaration Form 115A. It’s important that you read and understand the Medical Declaration Form 115A. If you have a medical condition listed, it doesn’t mean you can’t jump – you will just need your doctor to to sign Form 115B. If you have any concerns over health and fitness please contact us for advice. 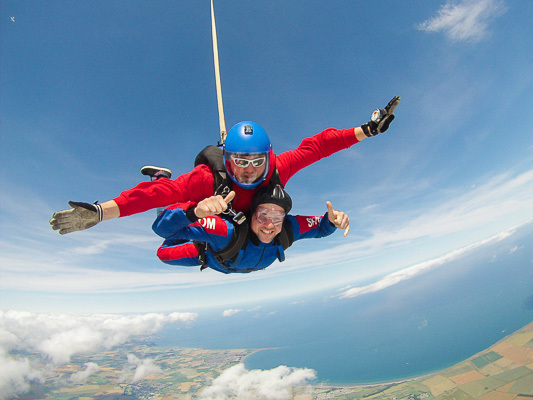 Gift A Skydive For Only £199 – A Saving of £50! This experience has changed my life, the instructors and the team were very professional and great to get along with, the jump itself is just incredible. Let's just say that I have booked myself on the training course... I can't wait to get back in the sky! 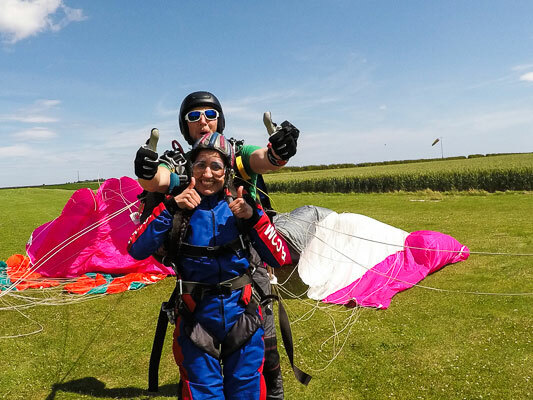 I did the tandem skydive and it was the best experience of my life! The whole team were friendly, funny and so enthusiastic! My instructor Colin was very knowledgable and made sure the experience was enjoyable! The most amazing experience of my life. I loved every minute. Instructors were friendly, confident, professional and fun.